Twitch Plays Pokémon's original run of 10 games starting at Pokémon Red and ending with Pokémon Omega Ruby came to be known collectively as the first season. Each run is the equivalent to a season episode, and can be referred to by number (e.g. S01R03). Timestamps mentioned in this article follow the format of "#d #h #m #s" (day, hour, minute, second). Twitch users controlled the character by submitting case-insensitive button names through the chat. Valid commands were A, B, up, down, left, right, and Start; Select previously was valid, but after it was used to soft reset the game, it was disabled due to having no other significant functional purpose. Each input in the chat was processed for one frame of gameplay, so the process of canceling evolution required three consecutive inputs of the B button in anarchy mode. Originally, players would simply submit buttons and the game would execute as many as possible. However, after players were stuck in the Rocket Hideout for almost 24 hours on the first spin tile puzzle, the host implemented a system where players could choose between anarchy (the original method) and democracy. In democracy mode, players' button presses are instead tallied, and then the most popular is executed; also, players can enter compound and iterative commands (such as "start9" and "upleft"). The "wait" command was also available in democracy mode, in which, when inputted, the player character takes no action until the next non-"wait" command is received. Players could vote to switch between anarchy and democracy by using "democracy" and "anarchy" as if they were buttons. 80% of the votes were required to switch from anarchy to democracy mode, whilst only 50% of the votes are required to switch from democracy to anarchy mode. The host said that the reason behind the asymmetry is that, with the previous system of requiring 75% of votes for a switch in either direction, it took a smaller majority to disrupt democracy mode than it did to reinstate anarchy mode. Simple tasks had often become extremely difficult due to the high number of players; players had spent hours trying to teach HM moves, cut down trees, pass through areas with ledges, and reach crucial points in the game. For more information regarding Pokémon caught and items obtained, see here. The player character used the default name of RED and started with Charmander, and has the Trainer ID number 20152. The player entered the Hall of Fame and finished the end credits at 16d 7h 50m 40s. After the game was continued, it froze and the timer was reset permanently to 16d 7h 50m 19s, with a timer counting down from approximately 27 hours reading "A new adventure will begin". The header above the video was later changed to "TwitchPlaysPokemon playing Gold/Silver/Crystal". The save file has reached the maximum amount of playtime that can be recorded within the game, 255 hours. 27 hours after Twitch viewers defeated Blue in Pokémon Red, Pokémon Crystal was started, on March 2, 2014. Unlike Red, an entirely new game was started, allowing viewers to name the player character: AJDNNW, Trainer ID of 47901. At 9d 21h 24m 49s days, and four battles against Lance, the players became the Champion. After the credits, the players started a new game, which was quickly reset to the aftermath of resuming the initial adventure at New Bark Town. At 12d 5h, anarchy mode was permanently established and the players were given the deadline of one week to defeat Red. After the deadline, a Pokémon Emerald playthrough will begin automatically. After 13d 2h 2m 41s, and seven attempts, Red was defeated. The game was last saved on Route 36, near the crossroads where Sudowoodo is encountered. Originally, during Pokémon Red, players would vote to choose between anarchy and democracy as the game progressed. With the start of a new game, this system was changed to a different style, where players are no longer allowed to change between anarchy and democracy at any time. Instead, the game starts in anarchy mode while a timer counts down at the top of the stream. At the start of every hour after the start of the game, the countdown reaches zero and democracy mode takes over. In democracy mode, players are allowed to vote for which button they want used, along with both an option to vote for "anarchy" and to vote for the "wait" command. If anarchy is the most popular command when the votes are tallied, then the game will automatically switch back to anarchy. The countdown is then set again to reach zero at the next hour, whether it is in an actual hour or in a minute. Around 7d 4h, the anarchy/democracy was adjusted once again. It was completely overhauled into a new system, in which a certain command had to be entered ten times within a period of 500 milliseconds for it to be executed. This system was briefly abolished an hour later, reverting to the format described in the previous paragraph, until resuming the new form twenty minutes later. Anarchy/democracy was re-established at 8d 5h. Hacks in this game were more prevalent compared to the previous game. For example, the players obtained Steelix when Onix evolved at level 35. Red's NPC team is identical to his final team in the previous game, barring nicknames; their levels were adjusted to match the levels of Red's original team in Crystal. After Red was defeated in Pokémon Crystal, the timer for Pokémon Emerald to begin was not reset. In the meantime, the site hosting Twitch Plays Pokémon featured various games, including fan-made Pokémon games, anime episodes via Game Boy Advance Video, and other Nintendo games such as The Legend of Zelda: Link's Awakening, Golden Sun, Pokémon Pinball: Ruby & Sapphire, and Mother 3. At 15d 4h 30m 46s, Azumarill became Twitch's first to reach Level 100. At 16d 22h 28m, a Shiny Chinchou was encountered and subsequently knocked out. The player defeated the Champion Wallace at 20d 21h 55m 29s. Unlike Pokémon Red and Pokémon Crystal, Pokémon Emerald is being played in high definition and is not a modded version of the game. Also, democracy mode was completely disabled, with pure anarchy enabled, making the game more akin to the first half of the Red run. Furthermore, the bottom of the screen now permanently displays each Pokémon the player has in the party, including levels and percentage of HP remaining. This display also reflects the order of the party whenever the party is being viewed in-game. The L and R buttons are also available as command options, since Pokémon Emerald is a Game Boy Advance game. At 6d 8h, it appears as if, while still in anarchy mode, players could now link multiple commands at once (termed as "combinations"/"combos"); unlike democracy mode, where linked commands were done in sequence, these linked commands are considered to be buttons pressed at the same frame in the game. The input of a combination in the chat consists of two commands divided by "+" signs (such as "B+Left", which would make the player run to the left). Also, Select was enabled, with Start disabled. At 6d 9h, Start was temporarily enabled for several minutes, before a new system was enacted, enabling Select again (without Start). Start and Select are alternatively available once each per minute. At 8d 9h, the feed was edited for each comment posted in the chat to be read in a robotic voice, but was removed shortly after. Approximately at 10d 11h 17m, it was noted that the Select button was not disabled, but that inputs of the sequence of "SelectBRA" would be modified to become "SelectB". The "Wait" command can also be inputted in the chat (lasting for exactly the time that is assigned to that particular input), despite anarchy mode being active; however, "Wait" cannot be combined with any command. Certain combinations of commands are prohibited and may not appear in the same combination, consisting of "Left and Right", "Up and Down", and "Start and Select". Moreover, identical commands may not be repeated within the same combination (for instance, "Left+Left" would be an invalid combination). At 12d 17h 32m 41s, a timer of 60 minutes was enacted to count down to democracy mode, in response to the difficulty of Seafloor Cavern. Now, after an hour's worth of anarchy, there is a five-minute voting session on whether to keep anarchy or switch to democracy. Should it switch to democracy, it is subject to switching back to anarchy at any time with enough votes. Commands can still be linked, which (if enacted) will be executed in a frame-by-frame state. Unlike past streams, a maximum of three commands can be linked. At around 14d 20h, a timer of was put in between the game time count and the next vote for anarchy/democracy, counting down from 3d 4h for an automatic start of a FireRed stream with random Pokémon encounters. 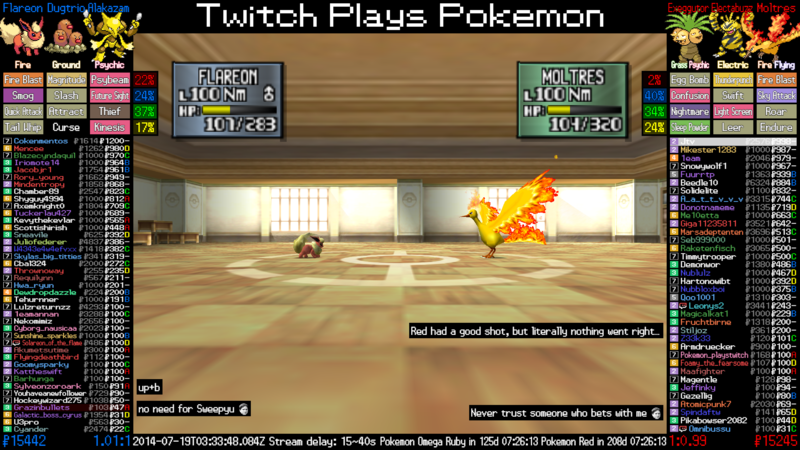 With Champion Wallace undefeated at 18d 0h 3m, at which point the FireRed stream was to presumably begin, the host added an extension of 3d 1h to the FireRed timer, citing that they "overestimated everyone's ability to finish Pokémon Emerald" and had never intended the time limit to be implemented as a definitive/strict time limit. The Select option was then removed sometime in the next two days. As the Select button was not initially disabled, the game was inadvertently soft reset several times. The male character was almost selected and named MILTON, before the female character was selected and named /'. The game was then soft reset and the female character was selected, named CAMILA. After being soft reset a third time, the game was saved under a character named T. Despite saving, the game was soft reset a fourth time. The female character was selected and almost named HAZEL. This was canceled and the male character was selected, almost being named REID. The female character was almost named !! ?, before settling on a final name of A.
Pokémon FireRed was originally planned to start on April 8, 2014. However, the host added a few more days to the Emerald playthrough since the Elite Four had not yet been defeated in the time given. The Elite Four was finally beaten on April 11, 2014. FireRed was started at 2:00 AM, April 12, 2014, UTC. Rather than the conventional FireRed version, a randomized game was started, with the starter being a level 5 Machop with Truant. Additionally, it is also modified so that Pokémon names are not in all capitals (e.g. "Bulbasaur" rather than "BULBASAUR"). However, Farfetch'd is displayed as "Farfetch'D". The player defeated Champion GREEN at the Pokémon League at 15d 2h 1m. The timer for Pokémon Platinum then started from 6d. At 7d 5h 16m, a Shiny Pikachu was encountered. At the beginning of the game, the game was placed in permanent anarchy mode with no ability to vote for democracy. In this randomizer, the possible wild and Trainers' Pokémon in an area, their level-up moves, their Abilities, and their held Items are all randomly pre-determined. A link showing each Pokémon's altered Abilities and Level Up set can be found here and here. At 3d 19h 45m, colors were added to usernames in the box showing the commands being entered. Each color represents what game the user first participated in: white is for Pokémon Red, purple is for Pokémon Crystal, green is for Pokémon Emerald, and orange is for Pokémon FireRed. At 5d 3h 28m, hour-long countdowns for anarchy were once again re-enabled, in response to the spin tile maze of the Rocket Hideout. At approximately 8d, the anarchy/democracy timer was changed so that the timer to countdown to democracy lasts 70 minutes. Also, it was implemented that every fifty minutes, the commentary in the chat box would be read in robotic voices for twenty minutes. At 14d 23h 33m the robotic voices and democracy were removed. In addition, a timer counting down to the start of Pokémon Platinum was added. At 15d 1h 44m, the timer was changed to 6d 15m. Pokémon Platinum was planned to start on April 29, 2014, but was later changed to start on May 2, 2014 following the premature victory of FireRed. During the wait period, Pokémon Stadium 2 was introduced. 3 v. 3 computer-controlled battles selecting moves randomly with randomly selected Prime Cup Rental Pokémon are conducted, and users can placing bets on either the team. Each user has 1000 to use initially, but they will never have less than 100. Also available was Mario Party DS until the countdown reached 2h, at which point the title screen for Platinum was displayed. Barry, the rival, was given the name "Pearl", one of his default names. The Pokémon Stadium 2 stream continued to be playable until 1d 11h. It reset and resumed play on 1d 8h 40m 50s, and is still ongoing. The player defeated Champion Cynthia at the Pokémon League at 17d 11h 38m. This was the first time a game was completed with an anarchy-only system, as well as the first time the party was not fully evolved (discounting the Graveler from Emerald). At 5d 11h 16m, Bronzor contracted Pokérus, and it spread to the other party members. At 6d 22h 6m a Shiny Geodude was encountered. In order to use the touch screen, players can enter inputs as coordinates in an (x,y) format. The coordinates can range from (1,1) to (256,192). Since this is a DS game, X and Y are now enabled as commands; START and SELECT are disabled. In addition to the colors introduced during the Pokémon FireRed run (for the usernames in the box where the commands are being entered), gray was introduced for users who first participated in Pokémon Platinum. The team display also now shows the amount of Badges and money earned, as well as the both the total numbers of species of Pokémon caught and seen. It also displays the moves, gender, and some status conditions of the current Pokémon in the party. As opposed to past games, only one frame of B instead of three is needed to cancel evolution, making evolution much more difficult. Also, occasionally (often on raining routes), the screen glitches up so that the player character is surrounded by a black square(s). At 7d 8h 37m the START and Y buttons were enabled. At 16d 20h 7m, a timer was implemented counting down from 4d 47m to a randomized HeartGold game. This timer was not readjusted following Cynthia's defeat. A randomized version of Pokémon HeartGold started on May 23, 2014. The Rival was named 4. At 11d 9h 9m Champion Lance was defeated, marking the completion of the Johto League. At 18d 20h 33m A was defeated atop of Mt. Silver. The game was last saved in Violet City. In contrast with the randomized FireRed game, certain NPCs carry different teams depending on time of day. In addition to the colors used during the Pokémon Platinum run (for the usernames in the box where the commands are being entered), yellow-gold was introduced for users who first participated in Pokémon HeartGold. Instead of requiring to know Mimic, Bonsly evolves at Level 17. At 2d 8h the streamer said that if players couldn't get through the Ecruteak Gym in at least 12 hours, then the stream would change from anarchy. At 2d 20h, the Pokémon Stadium 2 stream started to display a leader board of all users active within the past twenty-four hours with over 10000. At 3d 3h, a ten-minute countdown to anarchy appeared, but democracy was immediately voted back in afterwards and no subsequent timer reappeared. At 14d 20h 29m a timer was implemented counting down from 7d 21h to the start of Black. Similar to how Red's team in Pokémon Crystal was based on the player's team from the Red run, Red in this game is replaced by Leaf (albeit retaining the name "Red" due to hacking difficulties) who has a team based on the FireRed run. Pokémon Black began when the timer reached 20h 29m 19s. The player defeated Ghetsis at 12d 18h 18m. In addition to the colors used during the Pokémon HeartGold run (for the usernames in the box where the commands are being entered), black text with a white outline was introduced for users who first participated in Pokémon Black. In addition, inputs are received at a faster rate compared to previous games. In the external party display, burns were wrongly depicted as sleep. At 0d 20h 39m the C-Gear was permanently turned off, after several visits to the Entralink in a short period of time hindered progress. Following the defeat of Ghetsis, a timer was implemented counting down from 8d 5h to the start of Black 2. Pokémon Black 2 is using the vanilla version of the ROM hack Pokémon Blaze Black 2. The rival was named HughMR. Currently, the player has obtained all eight badges and has beaten the Pokémon League. At 16d 22h 23m 05s, a timer counting down from 4d 01h 36m 55s towards the start of Pokémon X begun, although the Blaze Black 2 stream continued. At 16d 10h 39m, a level 75 Dialga was caught. The streamer threatened to end the game at 2d unless the players attended the Pokémon World Tournament. There, the player battled against the past incarnations of Twitch protagonists in reverse order (including sprite, names, and illegal Pokémon's moves but not illegal Abilities). Red was defeated at 19d 2h 16m. Unlike previous games, a code that prevents evolution from being canceled is also implemented. In the external party display, paralysis was wrongly displayed as sleep. At 7d 7h 35m the fans in the Mistralton Gym were adjusted to go off every 8.53 seconds. At 8d 1h 29m the fans were adjusted for a second time to go off every 15 seconds. At around 8d 3h 14m the fans were adjusted again to go off every 17.1 seconds. No new color was introduced for Black 2, it used the same one as Black. Pokémon X began on July 27, 2014 and ended on August 4, 2014. Calem with blond hair was the chosen protagonist. Post-game featured a lot of trading; as such, the information related to the post-game team is incomplete. Instead, the team listed below corresponds to the group of six that reached the Hall of Fame. After the game ended at 8d 0h 0m, the stream ran a modified version of the Stadium minigame as intermission between X and Omega Ruby. For the first time since its inception, the Pokémon Stadium 2 side game was discontinued following the end of the Pokémon World Tournament in Blaze Black 2. The streamer commented that it would return during future intermissions as a full screen. The prototype photo also showed the streamer intends to start Pokémon Omega Ruby on its release date of November 21, 2014 and an encore of Pokémon Red on approximately its anniversary of February 12, 2015. The colors indicating when the player joined were abandoned in favor of chat's colors. Pokémon Omega Ruby started on November 22, 2014 (rather than 28th) and ended on December 2, 2014. The information below is actual as of 8d 19h 10m. After the game ended at 10d 0h 0m, the stream started Pokémon Battle Revolution. The players have obtained the Shiny Beldum gift at 26m, although it was released at 12h 22m. At 4d 9h 25m, they have managed to enter and win a Contest (winning a Master Rank contest at 8d 13h 29m). The crisis has been solved at 4d 18h 34m, followed by defeating Steven for the first time at 6d 20h 16m. Delta Episode was finished at 7d 9h 8m. Steven has been defeated once again at 8d 5h 42m. This page was last edited on 27 November 2018, at 13:50.